This is a copy of an article published in The Peak Advertiser, the Peak District's local free newspaper, reproduced by kind permission of its author, Julie Bunting. ‘People don't know about us ... what this place is ... what we do ...’ - recurring comments from students and staff at Cliff College on a recent visit undertaken for the enlightenment of our readers. Yet every week thousands of people drive past the main entrance, with its discreet sign and intriguing glimpses of a beautifully sited property in the lee of Curbar Edge. On the other hand, thousands know exactly where to come when this Evangelical Bible College holds its famed annual gathering. Similarly, the welcome could not have been warmer for this lone writer from the Peak Advertiser during a recent visit to what everyone there calls, simply, ‘Cliff’. The hospitality was set in hand by English tutor Ann Hodgson, waylaying passing students to tell me something about themselves. Most of them had learnt of the existence of Cliff through word of mouth. From a wide age group and sharing a diverse denominational background, undergraduates and postgraduates of many nationalities come to study full-time or part-time courses in theology and mission, including a popular stream of programmes focusing on children's and youth work. There is also an International Learning Centre. All courses are fully validated by the University of Manchester. Cliff College Principal, the Reverend Dr Chris Blake, stopped by to share the news that Cliff had just passed its 5-year validation inspection, earning high praise for its academic standards. Placements around the Peak The community ethos here is tangible, with all students asked to serve around three hours of work a week on site, from administration and tutorial support to gardening and housekeeping. Yet this is also a typical student campus with the obligatory exuberant leisure activities. Female students were first admitted in 1966, since which time lively social events have brought ample opportunities for matchmaking - one current student is the daughter of parents who met at Cliff. Here too are married couples, perhaps at different stages of study, while second- or occasionally third-generation students maintain family tradition. The student body spans a vast demography, from school leavers to the retired. A good number are non-resident and many have a ‘day job’. Some 60 full-time students are on Mission placements in Chesterfield, Sheffield and around the Peak, involved with after-school and youth clubs, Sunday Schools and youth work in urban priority areas. Some take part in prison visiting, others hold voluntary placements with a hospice and with an organisation working with women involved in prostitution. ‘Joyful News’ The actual Cliff House was built in 1790 by Thomas Gardom, who had purchased his first strip of land here for just under £28. The property, with its farm buildings and grassland, passed to his son-in-law, James Hilton Hulme, a committee member of Calver and Stoney Middleton Mutual Improvement Society. Hulme extended the house and built a Congregational chapel for public worship, with regular baptisms and weddings and some form of schooling for local children. In 1876 Cliff House was acquired by Henry Grattan Guinness, founder of Harley College in London. Guinness spent an astonishing £15,000 on ‘beautifying’ the grounds of his new property which, renamed Hulme Cliff College, became a centre for training missionaries until 1901-02. Many of those missionaries went on to work in South America and China; over 50 of them laid down their lives in the Congo. 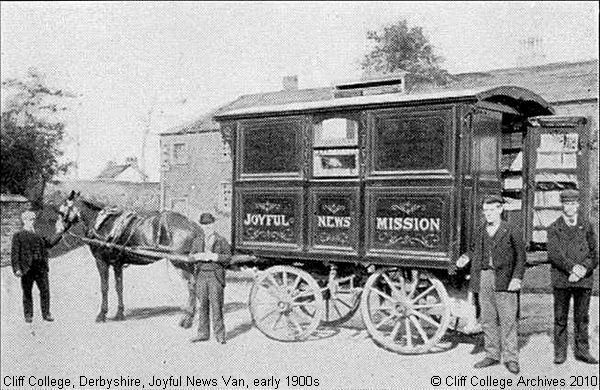 The wider story of Cliff is deeply rooted in the work of Methodist Minister Thomas Champness, who in 1883 launched the hugely influential Joyful News newspaper. His Joyful News Training Home and Mission was later encompassed by the Wesleyan Methodist Church, which in 1904 moved the college to its present location under Principal Thomas Cook. At that time the site had a massive astronomical observatory, built by Guinness, and below it a museum containing Cook's magnificent collection of shells and ‘missionary trophies gathered on Evangelistic tours’. 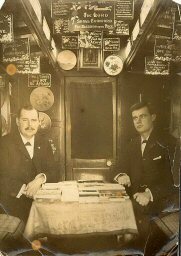 The Hallelujah Express In 1913 Cook was succeeded by Samuel Chadwick. It was he who established the Team Mission, a major and ongoing event. In office throughout WW1, Chadwick witnessed the transfer of students to the battlefields and closure of the college until 1919. Five years later, David Lloyd George gave the address at the opening of a new wing at Cliff with bedrooms and a library. The campus was further extended in the 1930s with the addition of Chadwick Memorial Chapel and a tea hall large enough to feed hundreds during the major gatherings. A row of cottages was built at the top of Cliff Lane for the use of garden and office staff. 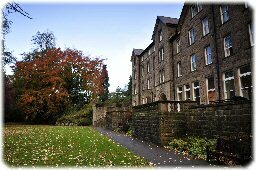 Cliff closed again as a college for the duration of WW2, when the premises were occupied by Sheffield High School for Girls. Under Chadwick the annual Whitsuntide anniversary used to attract some 5,000 visitors, far too many to be accommodated on site, and large numbers took bed and breakfast in private homes around Calver. Specially chartered anniversary trains included the famous ‘Hallelujah Express’ from London to Grindleford, picking up passengers en route and disgorging large crowds to walk across the fields to Cliff from Grindleford station. Some of our readers may have been at the greatest ever Anniversary meeting in 1954, when 60,000 came to hear the American evangelist Billy Graham. The crowds arrived on a thousand coaches, hundreds of cars, and buses running shuttle services from Sheffield, Chesterfield and Grindleford station. Gospel Cars From the early 1900s, Cliff students conducted Sunday services in nearby village chapels. Baslow village green was one of many open-air preaching venues and meetings were also held in men's lodging houses at Stoney Middleton. 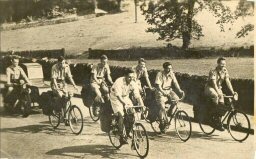 Sadly, in 1920 a young man named Stanley Benjafield was killed while cycling back to college. Fellow students paid for his headstone in Calver churchyard, the last resting place too of former principals and their wives, a tutor, evangelist, janitor and other staff members. 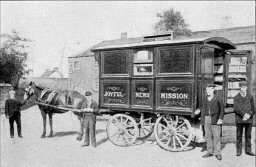 As time went by, areas further afield could be reached by the Gospel Cars and later Gospel Vans, a mission movement born of a single horse-drawn Joyful News caravan instigated by Champness. Used as a base, these mission vehicles often stayed in one place for several weeks to enable students to reach neighbouring hamlets and villages. 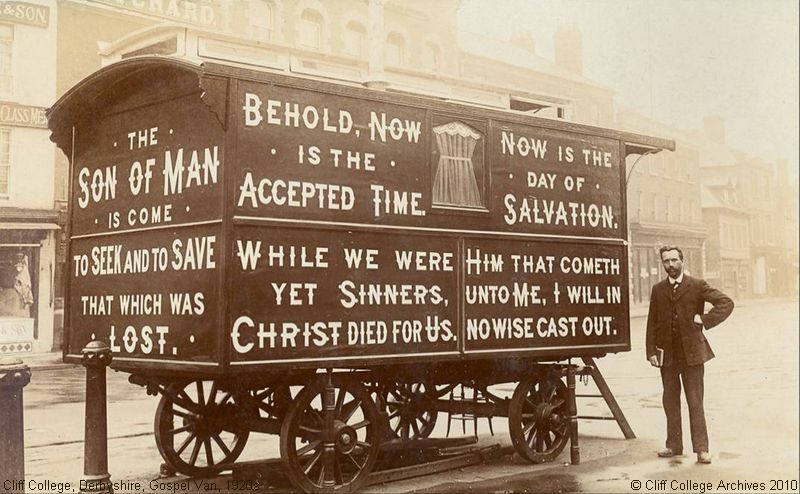 A photograph in the extensive Cliff archives shows a Gospel Van (pictured) with seating accommodation for tea and also selling plaques and china plates bearing such texts as ‘I will Trust and not be afraid’ or ‘My refuge is in God’. Another van has the trumpet of a wind-up gramophone on the front, through which 78 rpm records would broadcast hymns. Gospel Cars were also the forerunners of Trekking. 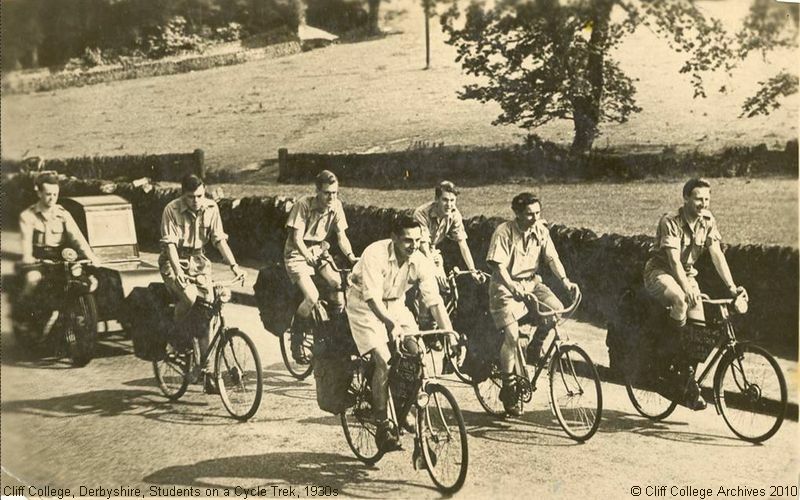 Between the 1920s and 1959, bands of Cliff students - known as the Trekkers, otherwise the Methodist Friars - tramped hundreds of miles with hand-pulled carts containing their needs, from Christian literature to eating utensils and tents. Trekkers got into training by hauling their carts up and down the arduous road to Curbar Gap! Resembling Scouts in their shorts and khaki shirts, they preached in market places and on village greens. When the fair came to Calver in summer, students were there too, preaching amongst the noisy diversions. 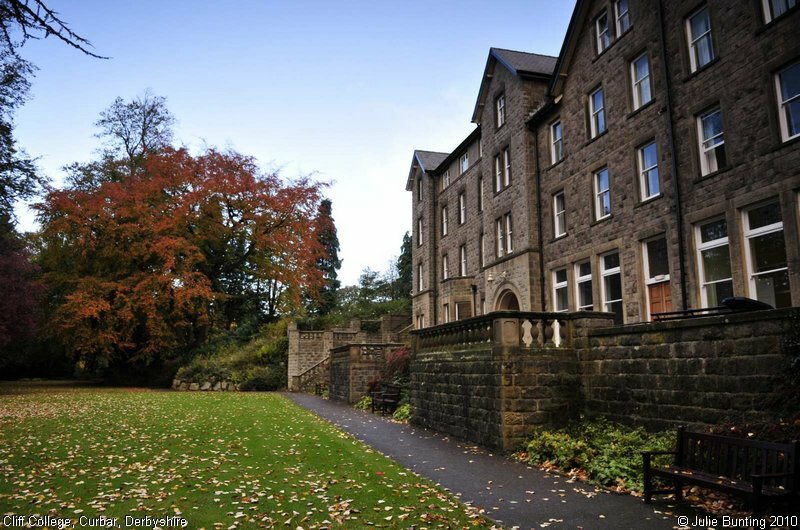 Although it was rare for Cliff students to carry out paid work, some were allowed to provide labour when the Derwent dams project reached the vicinity of the college, in turn evangelising amongst the navvies. On the Peak Scene In more recent times Cliff has played other unsung roles on the Peak scene. When Stoney Middleton was flooded in 1968, for instance, students were quickly on hand helping villagers to rescue belongings and serving hot tea from urns brought along on their minibus. Today there is a Play Group on campus serving the surrounding community, whilst the Conference Centre hosts day and residential conferences for groups from far and wide and of all persuasions, ranging from schools and churches to university departments. The anniversary weekend, meanwhile, has developed into The Festival held over Spring Bank Holiday weekend, this year [Ed: 2010] 28 to 31 May. Its theme is God Songs in a Strange Land. Festival Director Piers Lane stresses that visitors are welcome throughout: ‘Bring your tent and camp - or stay in one of the College rooms, or in a local B&B or caravan site’. Our images are courtesy of Cliff College Archives, the domain of voluntary archivists Clive and Russ; they would be delighted to learn of the existence of any relevant documents and photographs.